This Russian River Valley Pinot Noir is one of the best value wines on the market and has shown consistent quality for the last three to four vintages I've tasted. I actually had the opportunity to visit the winery on my last trip to Sonoma and it was a great experience too because they share their tasting room with Dutton-Goldfield winery, who I think make some of the very best wines in all of Sonoma. This 2006 Estate Bottled Russian River Pinot Noir was produced from 100% Pinot Noir aged 9 months in 100% French oak barrels. 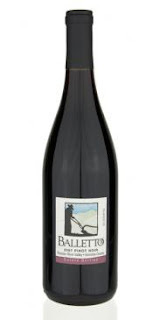 It is a light and subtle style Russian River Pinot with plenty of grace and elegance to go along with it's chiseled minerality and brimming acidity. Definately up my street from the way you descibed it! If I see it I will buy, providing they're not charging the earth.